Chicken inasal, MassKara festival, sugar barons and hacienderos come to mind at the mention of Bacolod. Lending a new meaning to Carrie Underwood’s hit, ‘Jesus, Take the Wheel,’ the Chapel of Cartwheels is nothing short of memorable. 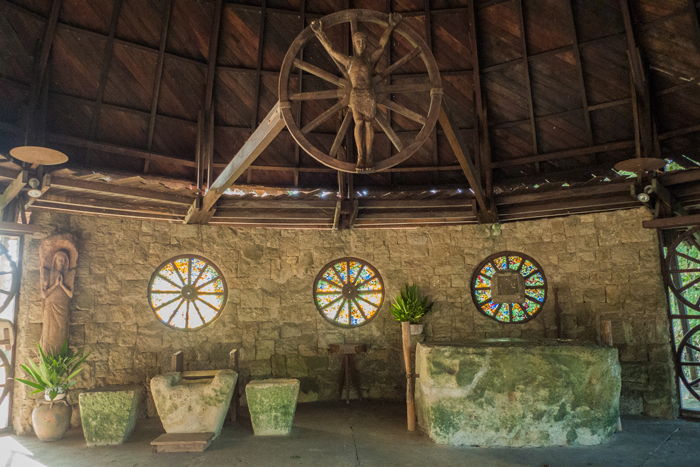 Shaped like a salakot, a Philippine hat used by local farmers, the chapel is furnished with farm implements. This design was meant to foster a deeper connection between the faith and workers. It is located inside Hacienda Rosalia, a sugar plantation owned by the Gastons. Built in 1948 and known by many names like ‘St.Joseph the Worker Chapel,’ ‘Ossorio’s Chapel,’ and ‘Church of the Angry Christ,’ it is considered as the first example of modern sacral architecture in the Philippines. 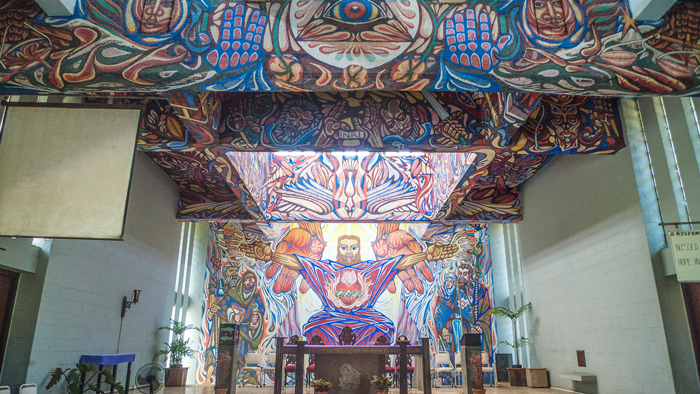 Designed by Frank Lloyd Wright’s apprentice, Antonin Raymond, a striking 60 square meter mural painted by Jackson Pollock’s patron, Alfonso Ossorio, lies inside its concrete walls. It is said that Ossorio used a special paint formulation that allows the reinforced concrete to absorb the pigment better. This keeps the mural vibrant despite harsh weather conditions.